October 8, 2015 (Lakeside)—A dedication ceremony for the newly completed Cedar Fire Historic Monument will be held on October 24 from 10 to 11 a.m. at the Lakeside Fire Protection Office and Fire Station 2, 12216 Lakeside Avenue in Lakeside. The monument includes a pocket park and honors first responders , those lost in the fire, as well as the strength and resilience of survivors. Other elements are a map of the Cedar Fire, fire resistant plants and a symbolic red flag pole. The monument has been designed as a place to inspire people to reflect, reconnect, and remember Lakeside’s struggle and rebirth after the Cedar Fire. July 19, 2015 (Scripps Ranch)—In 2003, the Cedar Fire destroyed over 200 homes in Scripps Ranch. To make sure residents are better prepared, the Scripps Ranch FireSafe Council will host a Scripps Ranch Wildfire Preparedness Forum on Saturday, September 26 from 9 a.m. to 3 p.m. at Marshall Middle School, 9700 Avenue of Nations in the Scripps Ranch community of San Diego. NBC Sports’ Josh Elliott will host the special hour with survivors of the Cedar Fire, who will chronicle their stories of survival before and after the 2003 Cedar Fire, the worst firestorm in California history. December 17, 2014 (San Diego’s East County) – The Cedar Fire started at night in a remote East County canyon. With no helicopters capable of doing water drops after dark, it quickly raged out of control, becoming the worst firestorm in California history. November 2, 2014 (San Diego) - Reporting San Diego sat down with Captain Ken Bortisser, the Public Information Officer of the Monte Vista Unit. Monte Vista is the name of the San Diego Administrative CAL FIRE unit. We talked about fire issues. June 20, 2014 (Alpine)--I am a 10+ year resident of Alpine, an 8+ year member of the Alpine Community Planning Group (ACPG) and a 6+ year member of the San Diego Rural Fire District (SDRF) Board of Directors. February 26, 2014 (Lakeside)-- Arriving at Blue Sky Ranch on January 16th, a team of 10 young adults from AmeriCorps National Civilian Community Corps (NCCC) began a 9-week service project. The team is working with Lakeside River Park Conservancy, Blue Sky Ranch and Silverwood Wildlife Sanctuary on various projects until their departure on March 20th. November 27, 2013 (San Diego) – Even now, ten years since the flames have died and the air has cleared, the sight of it all still seems unreal - the earth outside my door in smolders and flames. Waking up that Sunday morning to the sounds of Santa Ana winds and an unpleasant sky, the Great Fires of 2003 were still a world away. They were still off in some remote back-country. Dreadful to consider - but none the less esoteric, and lacking any influence upon my Sunday morning routine. November 2, 2013 (Cleveland National Forest) – It’s been ten years since the Cedar Fire. Now it’s the beginning of Deer Season. I put this video together years ago from a Power Point on the Cedar Fire from Cedar Gorge, in the first hours and the weeks and months to follow. For the milestone remembered this week, here's another moment, remembering that last night from a world we left behind. November 1, 2013 (San Diego's East County) -- Hear dramatic eyewitness accounts, some never before told, from survivors of the Cedar Fire, firefighters who battled the blaze and saved lives, and elected officials sharing their memories of the worst wildfire in California's history. We've spent weeks compiling these special interviews, reflecting on the past as well as how far we've come -- and what is still needed to keep us safe before the next firestorm strikes. Our one-hour special report will air today at 5 p.m. on KNSJ 89.1 FM, and again tomorrow at 9 a.m. Please tune in and sharet his information with your friends. October 25, 2013 (San Diego)—Today political leaders from San Diego City and the County came together with fire officials to remember the 2003 Cedar Fire. The press conference served as both a status report on our region’s ability to respond to the next emergency, as well as a memorial for the 15 San Diegans who died during the firestorm. September 28, 2013 (Lakeside) – On the tenth anniversary of the Cedar Fire, community leaders and fire survivors will gather to dedicate a historic memorial commemorating the worst wildfire in California history. The ceremony will take place on October 26 from 10 a.m. to 1 p.m.at River Park Fire Station #2, 12216 Lakeside Avene in Lakeside, a community that suffered devastating losses when the firestorm trapped people caught unaware of the inferno raging during the fire's first night. Cal Fire now ranks the Rim Fire as the fourth worst wildfire in California history, based on acreage burned nearly 225,000 acres. The fire could potentially surpass the 2003 Cedar Fire, which burned over 273,000 acres and remains our state’s worst wildfire ever in sheer size. But The Rim Fire is not likely to surpass the Cedar Fire in two other measurements of its disastrous scale. The Cedar Fire still holds the record of causing the most deaths—14, and burning the most structures – 2,820. Moreover, the collective toll of the 2007 wildfires here was even larger. July 11, 2013 (Mount Laguna) –Amid the devastation on Mount Laguna, one ironic symbol stands out: a flag flying at half-mast. Flown to honor the Prescott Arizona Hot Shot crew that perished at the Yarnell fire, the flag at the Al Bahr Shrine Camp survived the Chariot blaze, while much of the camp was reduced to ashes. As of 6 p.m. last night, Sunrise Highway was reopened at both old Highway 80 and Highway 79, though it remained shut down from Los Huecos Road (milepost 24.5) in Mt Laguna, to Kwaaymii Point ( milepost 30). The fire has burned over 7,000 acres and is 70 percent contained. June 10, 2013 (Lakeside) – Sheriff’s deputies executed a search warrant in the 12000 block of Old Barona Road in Lakeside on June 5 and found a large marijuana cultivation, Sgt. Craig Johnson reports. During the search, two women, ages 83 and 61, were detained but not arrested. The house on the property had been burned down during the Cedar fires and had not been rebuilt. The women were living in tents on the property. November 18, 2011 (Lakeside) --After 31 years of service to San Diego County, Undersheriff Jim Cooke is calling it a career. His last day on the job is Friday, December 2. Assistant Sheriff Ed Prendergast is taking his place. Cooke’s career including service in many high-profile East County incidents ranging from the Santana and Granite Hills high school shootings to the Cedar Fire. October 9, 2011 (San Diego’s East County) – East County Magazine has received the following request from a reader who is having trouble obtaining refinancing on a construction loan to rebuild her home destroyed in the Cedar Fire. "Updated Version July 30, 2015"
June 14, 2010 (San Diego) – Back in February 2009, East County Magazine published claims by electrical transmission expert Ed Clark, who contended that faulty power line installations caused the Paradise, Witch and Cedar Fires. Clark and two other experts consulted by ECM contended that SDG&E installations of two down-guy wires connected by a single bolt were dangerous. 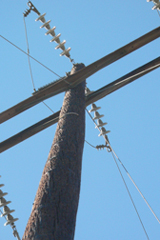 Clark, who has headed up power line installations for Southern California Edison and served as an expert witness for SDG&E, argued that SDG&E's installations were also illegal, violating a state rule requiring 12 inches of separation on poles. He provided evidence of arcing including charred, black marks on anchor bolts at the base of the pole where the 2003 Paradise fire began. October 26, 2003 (San Diego's East County)--Today is a day of bittersweet remembrance of October 26, 2003, when I watched the home I grew up in, my parents home of 34 yrs at the time, burn completely to the ground as the powerful, almost angry Cedar Fire consumed every inch of it right before my eyes. May 26, 2009 (San Diego's East County)--Insurance Commissioner Steve Poizner announced support of AB 157, authored by Assemblyman Joel Anderson (R-El Cajon). Poizner also offered disaster preparation tips for all San Diego residents, including advice for preparing a home inventory for insurance purposes.